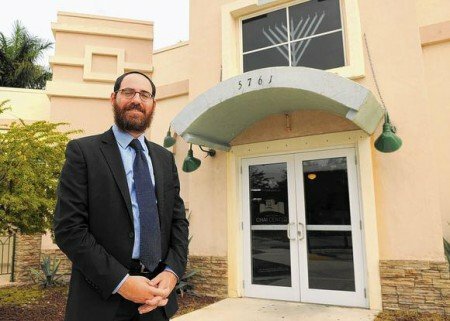 Vacant Café to Become Chabad For two years Rabbi Hershy Bronstein tried to buy the vacant Buffalo Southwestern Café building at 5761 Coral Ridge Drive to convert it into a Chabad synagogue. But it took the help of an evangelical Christian and divine providence to make the purchase happen. Late last year real estate broker Harold White, 76, of Miami, was walking from his car to the building to put up a "for sale" banner when he tripped and fell, hitting his head on the concrete sidewalk. Bronstein and his wife Chanie had just left the storefront Chabad synagogue in the nearby shopping center and were driving to the building when they saw White lying on the sidewalk. Chanie Bronstein brought a bottle of water to White. "I got up and took a drink and kind of brushed myself off," White said. "[Bronstein] said, 'You don't need to put [the building] on the market. I've been trying to buy it for two years.'" They went to the Chabad Synagogue of Coral Springs and briefly negotiated the sale price of the foreclosed building.At 9 a.m. the next day, White brought over a contract. Bronstein calls White malach [angel]. "He was determined to get it done," Bronstein said. "I believe it was held for us. Hashem gave us a gift." "I know God works in ways that we don't always understand," said White, a longtime member of Christ Journey Church in Coral Gables. There was a month-long delay over a zoning problem but the building sold for about $1.5 million, slightly below owner Wells Fargo's asking price, on Dec. 17 of last year. During that time, White and Bronstein became friends. "I became very fond of the rabbi," White said. "We like each other. He's a very sweet man. I think we'll be friends until the lord calls me home." Bronstein, 33, who grew up in Miami Beach, was considering a five year stint as a Chabad rabbi in Germany when he was invited in 2005 to start the Chabad in the Heron Bay area as an independent offshoot of the Chabad of Coral Springs. The new Chabad grew from a few couples who met in the rabbi's apartment to a small congregation that met in a school classroom, then to sharing a store in The Shoppes of Heron Lakes and finally to renting a storefront in the shopping center. "Every time [the rabbi] made a move, we thought he was crazy and he pulled it off," said Steven Kravatsky of Coral Springs, whose family was one of the few that started the Chabad. "The rabbi is just an amazing guy," said Kravatsky, a member of the synagogue's executive advisory committee. "He's incredibly persistent and smart. He doesn't let challenges deter him. He just carries on through. He goes step-by-step through the process. He has a goal [and] he wants to obtain the goal." Bronstein said the building was desperately needed for a congregation of more than 200 families that was outgrowing the 1,300 square foot storefront synagogue and renting space in another building for its Hebrew school. He said he saw the potential in the vacant building. "You've got to create a vessel and you believe," Bronstein said. "It's been a dream of the rabbi. We used to joke. We knew we had to have that building," said member Allen Kopelman, of Margate. "The building was a major landmark. It's important to have a presence," he said. A lighted menorah at the top of the building can be seen from the street. Bronstein said the Chai Center Chabad soon will have a sign. An architect has created plans for the renovation of the building and a cocktail event on April 6 will launch a $1.8 million capital campaign.